A DISCOURSE CONCERNING THE HOLY SPIRIT IN WHICH AN ACCOUNT IS GIVEN OF HIS NAME, NATURE, PERSONALITY, OPERATIONS, AND EFFECTS; HIS WHOLE WORK IN THE OLD AND NEW CREATION IS EXPLAINED; THE DOCTRINE CONCERNING IT IS VINDICATED FROM OPPOSITION AND REPROACH. THE NATURE AND NECESSITY OF GOSPEL HOLINESS; THE DIFFERENCES BETWEEN GRACE AND MORALITY — OR A SPIRITUAL LIFE LIVED TO GOD IN EVANGELICAL OBEDIENCE, AND A COURSE OF MORAL VIRTUES — ARE STATED AND DECLARED. 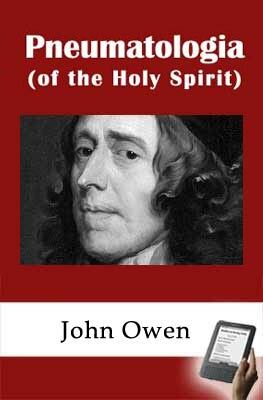 This is a restatement and simplification of John Owen's original work, but not a paraphrase. Its purpose is to make it more accessible to a modern audience of believers, not just theologians. You may reproduce the text so long as you do not change it or sell it to anyone. This restriction is placed on it so that the propagation of any errors in the modernized language is limited. If someone rephrases my rephrasing, the treatise will quickly degenerate into a misstatement rather than a restatement of Owen's work. The old English wording has been modernized, so that "thee" and "thou" are now "you" and "yours." American spelling has been largely employed (labor instead of labour). Inline scripture references may be superscripted to aid readability. Additional references are superscripted in blue. Roman numerals were changed to Arabic and corrected as needed. The difficult structure and syntax were simplified. Sentences in many cases were split into several sentences for ease of reading. Parallelism has been employed to maintain rhythm and clarity. The word "peculiar" is variously rendered "particular", "unique", "special," or "specific," depending on the context. Unreferenced pronouns and "understood" words have been made explicit. Now, Owen may have left personal pronouns ambiguous to reflect the mystery of the Godhead; but it was more obscure than mysterious. The passive voice is often changed to active. Duplicated texts, digressions not affecting the content, and alternate phrasings within the same sentence, have been removed for easier comprehension. Little-used words have either been annotated or replaced with simpler ones. Owen's wordiness has been reduced where possible. Formatting has also been revised (paragraph and page breaks, bullet points, etc.). There are two unusual uses of language that have been retained in the text. The first is Owen's repeated use of "afterward" — "it will be fully explained afterward." He doesn't mean at some unspecified time later in the book. He means it in a sequential and orderly sense. He will first handle the topic at hand, and then get to the other aspect immediately "afterward." The second unusual use of language involves the words "act, actings, actual, and actually." He uses the transitive form; we tend to use the intransitive prepositional form. We say that we "act in faith," or we "act under grace," and the Spirit imparts the grace that we act under. But Owen says that the Holy Spirit "acts grace" in us, and we "act faith" (rather than "act out our faith"). Actings are repeated acts of this kind; actual and actually are the proper adjectival and adverb forms of "act" (whereas today we use those forms to mean real and really). Owen describes a God-given "principle" – not a value, but an ability or a compelling power in us — that we act, or actuate, according to its purposes. We act the graces that He communicates to us by this principle. So, the Spirit imparts this principle to us, employing it to effect its purposes, using its real power in and through us, to produce its intended effects. And we freely participate by acting it — i.e., by putting that principle into gracious and holy action using our regenerated faculties. But in some instances, "acted" was changed to "moved," to be less distracting. Language today continues to deteriorate as visual and auditory media replace written media. So Goold's mid-19th century prefatory and analytical notes, have also been modernized a bit to ensure they are more readily understood. ORIGINAL NOTES are in black, some ending with "— Ed." My notes are in blue, some ending with "— WHG." All page number references are the original page numbers of the 1850-53 edition, which are displayed intra-text. Latin, Greek, and Hebrew phrases have either been removed from the body of the text (where they were more of a distraction than a help), or Anglicized with the Strong's number (NT:xxxx or OT:xxxxx). Some required clarifying text to make the point explicit. But Owen's full argument, supporting text, and style remain, as do William Goold's footnotes in their original languages. If you would like the digitized 1853 edition, with appendices cross-referencing both the Scriptures and original language used in the text, please consult CCEL's edition here: http://www.ccel.org/ccel/owen/pneum.html. My aim is not to preserve Owen's text, but his teaching. It would be a shame if a modern audience didn't benefit from his labors because his language was too complex, archaic, or arcane to grasp. As with each of these restatements, I hope this one makes it more accessible to you, bringing home the wonder and importance of the doctrines of the Holy Spirit that Dr. Owen drew from Scripture, and vividly explains here. There are few works on the Holy Spirit that have not been influenced by the Holiness movement of the 1800s, or the Charismatic movement of the 1920s. And there are few if any scholarly works outside those movements, that haven't drawn on this particular work of Dr. Owen to bring balance back to our view of the person and work of the Holy Spirit. Please read William Goold's Prefatory Note to understand where this treatise fits with regard to Quakers and Quietism, which was just then arising. See also the note on p. 527, and Owen's caustic description on p. 556. In Owen's introduction, "To the Readers," you'll see the same objections to dry rationalism that Jonathan Edwards later expressed in his treatise on Religious Affections (1746). Yet both men objected as well to the unfounded emotionalism that was rampant in their day — the term used then was "enthusiastic" or "enthusiasm." They weren't decrying passionate belief. Rather, they insisted that our passion must be born, provoked, and enlarged only by God's truth. Both extremes, cold intellectualism and wild enthusiasm, remain evident in our own day; and so the balance that Owen provides here is still greatly needed, and it will be useful to every believer.